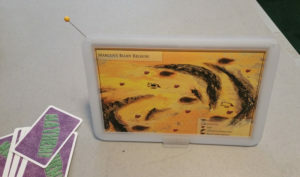 One of the things Alan, Sandra, and I discussed building as part of the Planet Mercenary Kickstarter was a Game Chief screen that would take drop-in sheets of paper, and which would be styled to look like a handbrain or display unit from the comic strip. We decided against doing this as part of the Kickstarter because we didn’t have enough information, and committing to something like this would put the project at risk. When the project overfunded to $300k, we committed to an R&D budget for unspecified stuff. This screen was some of that stuff. We contracted with a designer to build a proper prototype for possible mass-production. The prototype arrived, and I love it. The prototype is a high-res 3D print, so the plastic is translucent instead of opaque. 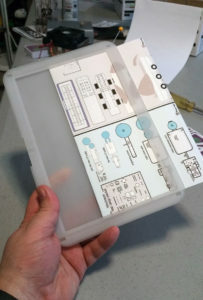 It’s designed to take half-sheets of US Letter sized paper. 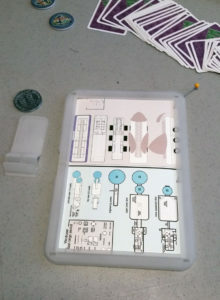 A full sheet of US Letter, printed with some game map stuff, is shown in the picture above. After folding that sheet in half, it drops into the screen quite cleanly. 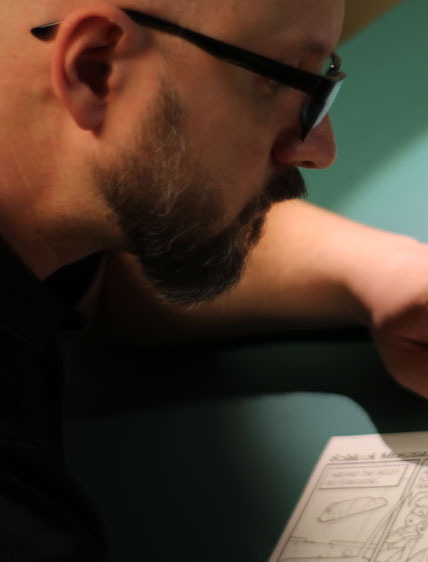 The stand upon which the screen sits is angled so that the drop-in is visible whether you’re standing or sitting, but it’s not angled so steeply that players will be able to see what’s printed on it, nor will they be able to see dice you roll against it. The half-sheet size makes this much easier to see over than conventional game screens. We don’t want Game Chiefs unable to make eye contact with their players. NOTE: There is a Game Chief screen shipping with the game. 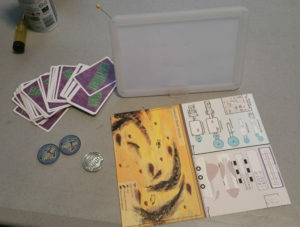 That screen will be made of card stock, and will be printed on one side with ship art, and on the other with useful tables and rules reminders. It, too, will have a low-profile format. Game Chiefs do not get to hide behind fortresses of stats and artwork. Here it is from the back. The fiddly-bit sticking out of the corner is a yellow map pin from the local office supply place. Note that the final product will not be translucent enough for anything to be visible through the back. Obviously it needs to store flat, so the stand detaches quite nicely. 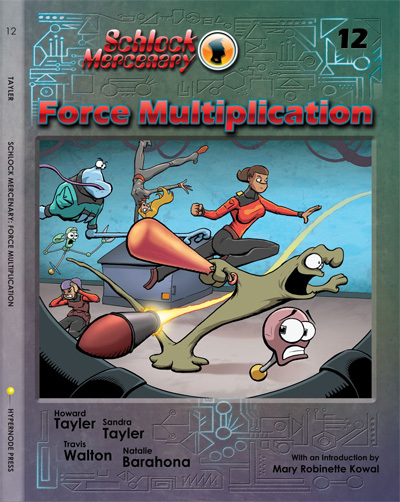 As an added bonus, this means you can put a note, or other mission-specific information into it, and pass it to the players, just like the characters in the comic do with their their handbrains. Sliding things into and out of it is quite easy. If your game is anything like the ones I’ve played, this is a critical feature. These aren’t for sale yet, and no, we’re not going to Kickstart them. We still have to grind a bit on the prototype to make sure everything is just right. 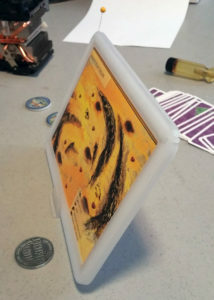 The eventual plan is to mass-produce these and sell them in sets of three. Small Biz Saturday Monkey Bundle! Monday Update: Well, that’s it for Monkey Coins for 2015. We have sold out. Buy four, get one free! If you’re looking for the perfect gift for the person who has everything, this might actually not be the right gift. This is the perfect award for the person who jumped between you and a poo-flinging monkey even though the monkey was not, strictly speaking, theirs. Alternatively, this is a consolation prize for someone whose poo-flinging monkeys are not your problem. I’ve been told it’s a great gift for when it’s your last day at a particular job, and you want to leave a memento behind for the poor sod who still works there. 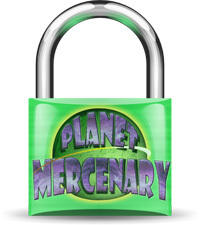 These have been the runaway favorite among the available Schlock Mercenary challenge coins. We’re almost out of them, and may run all the way out before Christmas. We will re-order them eventually, but that won’t be until 2016.